Sports Shooter Destination: 'Making It Happen' - A Student's Journey to Peru. 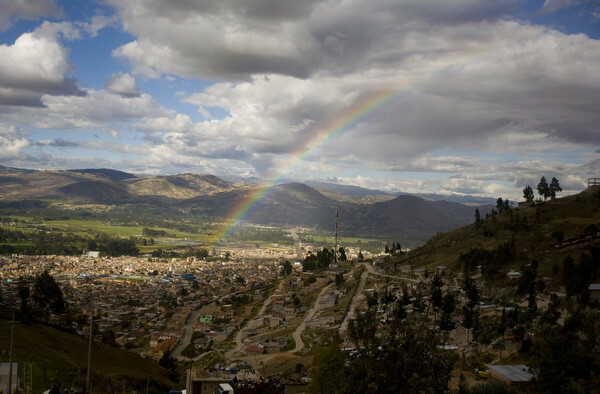 A rainbow appears over the City of Cajamarca in the Northern Highlands of Peru. I was driving home from my parent's home in Tennessee after a much-needed escape from school last spring. I had been contemplating my summer plans, and I decided I wanted to try something different than an internship. Not because I felt that I had learned everything I could, but I knew deep down that I needed to do something else, something completely different. I decided I would go to South America this summer. No matter what challenges arose, I would make it happen. For as long as I can remember, I had dreamed of traveling. I knew I wanted to travel, my friends knew I wanted to travel, and so did my family. The only problem was I had never been anywhere before and with my financial situation as a student, it looked like I wouldn't be going anywhere anytime soon. It seemed impossible. I contacted a friend who moved here from Peru two years ago and told him about my plans to travel and my lack of funds. I asked if he knew someone who could use my help shooting photos, building things or even sweeping floors. He spoke with a friend of his in Cajamarca, Peru, who agreed to house and feed me in exchange for photos to use at his printing business. I was ecstatic. The next problem was that I did not speak a word of Spanish. I talked to another friend who was doing a study abroad in Costa Rica for the month of June, and decided I would go with him. The program got me six credit hours and took care of both my foreign language credits at Western Kentucky University. It got me room and board with an incredible Spanish speaking family - all for around $2,000. That is cheaper than what it costs to take those same classes at WKU. And after some searching, I found round-trip plane tickets for around $350. That's less than I would pay to visit my friend in Dallas. Costa Rica was great; I learned a lot of Spanish and spent the weekends on the beach. I made some great Costa Rican friends that I still talk to weekly. But for me, Peru was the highlight of my summer. I arrived at the Lima airport not knowing who I was supposed to be looking for or what to expect. Luckily, the guy (owner of the previously mentioned printing company) found me and we took off. After a 16-hour bus ride to Cajamarca, I was where I was going to be for the next month. 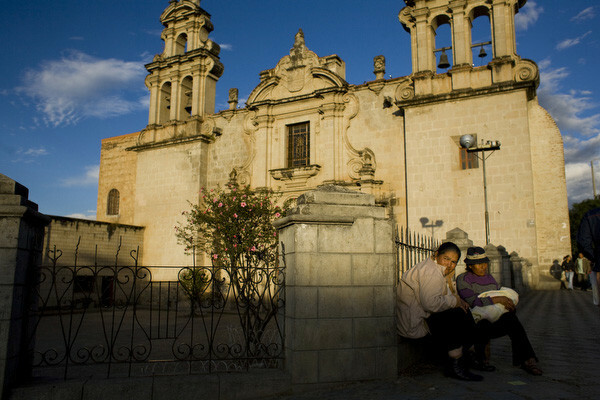 Residents sit outside of a church in Cajamarca, Peru. My new friend Walter had arranged for me to stay in a house in the center of Cajamarca, close to everything. My house turned out to be a local non-governmental organization (NGO) that worked with children from the street and housed other travelers and volunteers from all over the world. Although people came and went, the core group included a guy and girl from Italy, a guy from England, guy from France and two girls from Germany. I was the only American and I loved that. At any given point there were three or four different languages being spoken, but usually it was Spanish. From the beginning we were all like family, and would cook together, go out to dinner together, and stay out dancing until 6 a.m. It was the best part of my trip. Yes, even better than the photos. After I got over altitude sickness, and had been properly medicated with loads of coca tea, I spent most days just wandering around the city. Cajamarca is unique in that not many tourists make their way that far from Cuzco and Lima. Its also interesting because within 10 minutes you could be standing on the main square having a cappuccino watching young urban kids skateboard, or wandering on a grass covered hillside next to pigs, chickens and cows (Peru's version of free-range organic) and traditionally dressed Campesinos who lived in dirt houses without running water. Every day and every task was an adventure. One day you would walk out your front door to find all of the taxis on strike. Not knowing much Spanish made everything a challenge from buying toilet paper to ordering food at restaurants. They don't serve fajitas and burritos in Peru. They do, however, eat lots of Cuy (a.k.a. guinea pig) and even have a festival dedicated to the furry little creature. I found that the people there were eager to show me their country, of which they are very proud. But with this eagerness though came a sense of hesitation to allow their photos to be taken. I was shut down a lot. I mean a lot. I definitely had more luck when I was with someone form the town. Not because I wasn't capable of asking in Spanish but simply being with a local often times meant people would open up their homes with no suspicions or questions asked. Yes, I did have to pay for some photos. Although I tried not to most times, it's impossible to say no when you are a foreigner with a camera that costs more than a year's wages for them. 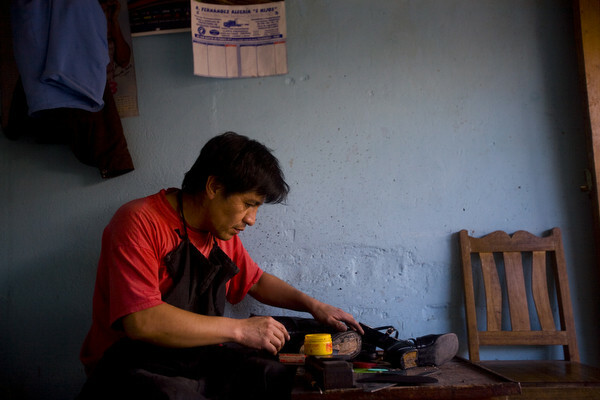 A man hand makes shoes at his shop in Cajamarca. I would have liked to do some more in depth work but learned very quickly how hard it is to do this in such a short amount of time. So, I settled on just seeing all I could see and shooting some frames along the way. I am planning on going back to South America, hopefully next summer, with a better understanding of the language and a few stories in mind. I would like for it to develop one day into shooting for a Central or South American based NGO either here, in the states, or down south. No matter what happens, it was the best experience of my life. I came back a different person than when I left. People in South and Central America are so full of passion and life. They value family above all else, and they value their education. They dance and drink, play music and soccer all day long and tightly embrace the traditions long held by their country. I tried to bring as much of that lifestyle to my own life as possible. One last thought: I found that, unlike the U.S., in places like Peru or Costa Rica people are more willing to take advantage of an opportunity that sounds good and logical, even if it's a bit unorthodox. In the U.S. I am always told, "that's not how we do things" or "we have a process for that." But for instance in Peru, I asked someone how I could be certified to teach English at a college in Cajamarca, and he told me "if you want to teach, I will give you the certificate myself." Sometimes, people don't realize the opportunities that are out there to be taken if they just try, or they assume the answer will just be no.